LP0201. 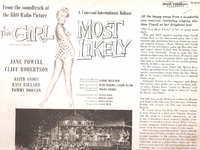 THE GIRL MOST LIKELY, 1957 RKO Radio Film Soundtrack, w.Jane Powell, Cliff Robertson, Keith Andes, Kaye Ballard, Tommy Noonan . [THE GIRL MOST LIKELY was the final film produced by RKO at its Hollywood studio, marking the end of big studio musicals, the end of an era, as well as the end of RKO studios itself. Filmed in 1956-57 and released in 1958 through Universal.] Capitol grey label W-390.